Oh how it seems that just a couple of weeks ago our effort was rewarded and this study in angles was the prize. 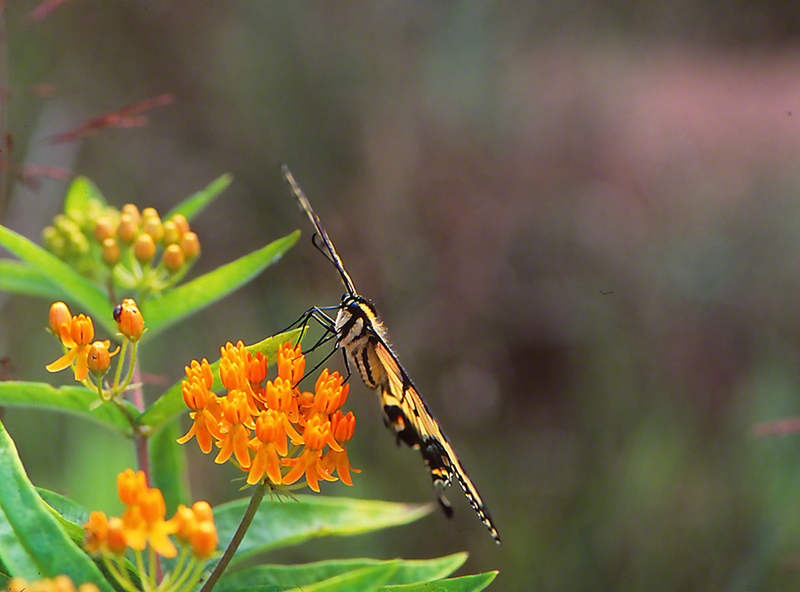 Papilio glaucus nectaring on Asclepias tuberosa. Rain is steadily falling this morning in Pittsburgh, with a 45 degree Farenheit temperature reading. So where are our featured butterfly and wildflower on this late October morning? She has passed on to dust to dust. The progeny that she surely produced now are hidden or not as pupae, in tree hollows, wood piles and downed logs. The Butterfly weed can no longer be found above ground, resting below the surface, roots and stem await the signals that Spring ’14 will provide. In most years, the leaves you see here would present damage to their tips, evidence that Monarch caterpillars had been feeding on their primary food, the leaves of milkweed plants. No so in 2013. Very few Monarch came up north here to Raccoon Creek State Park, 40 minutes from Pittsburgh. Severe late winter weather probably destroyed countless million of the Monarchs, as they perched overnight, much too cold in the otherwise hospitable forest of Tennesse, Alabama, Kentucky and West Virginia. Who visits wingedbeauty.com? Who will see this photo? Visitors come from more than 75 countries. Where they come from is fascinating. For example, Trindidad & Tobago has a population of 1.2 million people. China has a population of 1.3 Billion people (yes, that’s a bold B). Ready? Trinidad & Tobago brought many more views here than have come from China! These last 2 years, Chinese citizens viewed fewer than 5 of our posts. And that’s because? Jeff Zablow	Tagged Asclepias tuberosa, Butterflies in Pennsylvania, downed logs, Hooray for Trinidad & Tobago!, otherwise hospitable forest, roots and stems, Severe late winter weather, Tiger Swallowtail on Butterfly Weed, Trinidad and Tobago, Where are the Chinese?